Season 4 of Arrow is currently shooting in Vancouver, with the premiere episode entitled Green Arrow set to air Wednesday, October 8 at 8 PM ET on The CW. Yesterday, we got our first look at the new costume worn by David Ramsey's Diggle, and today we get our first look at one of the many new characters debuting this season, Rutina Wesley's Liza Walker, a.k.a. Lady Cop. 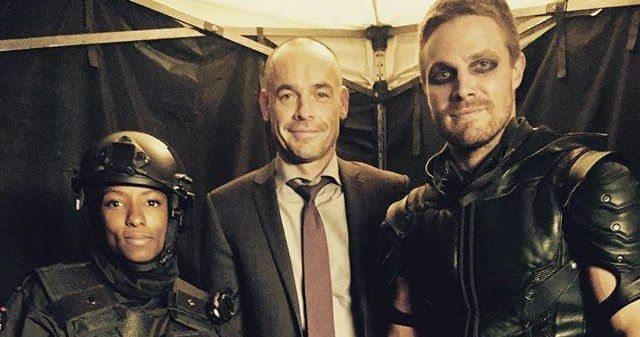 This image comes courtesy of series star Paul Blackthorne, who posted a photo from the set with Rutina Wesley and Stephen Amell on his official Twitter page. Rutina Wesley's Lady Cop will be part of Star City's anti-vigilante task force in Arrow Season 4, although it isn't quite clear what episode she will debut in. She is just one of many new characters slated to arrive in Star City this season, along with Neal McDonough as Damien Darhk, Alexander Calvert as Anarky, Echo Kellum as superhero Mister Terrific and Jimmy Akingbola as the villainous Baron Blitzkrieg. The Season 3 finale, "My Name Is Oliver Queen", ended with Oliver (Stephen Amell) and Felicity (Emily Bett Rickards) leaving Star City to start fresh, but we'll have to wait and see what brings the couple back to their home city. Caity Lotz, whose character Black Canary was killed in the Season 3 premiere, will also make her return in a Season 4 episode of Arrow, where she will be reportedly brought back to life through the Lazarus Pit and resurrected as White Canary. There is speculation that this will happen in the same episode that Matt Ryan will guest star as John Constantine, since his character has expert knowledge of the Lazarus Pit. It still hasn't been confirmed which episode Caity Lotz will appear in at this time, so we'll have to wait and see if she crosses paths with John Constantine. There has also been speculation that DC Comics heroes Batman and Green Lantern will make appearances in Season 4, but that has yet to be confirmed. DC's Legends of Tomorrow character Hawkman, portrayed by Falk Hentschel, is set to appear in both Arrow and The Flash before DC's Legends of Tomorrow debuts next spring. With the season premiere just over one month away, there will surely be many more characters announced, so stay tuned. After defeating his most formidable foe to date and riding off into the sunset with longtime flame Felicity Smoak, Oliver Queen (a.k.a. The Arrow) left Starling City with the hopes of beginning a new life. But will Oliver ever truly be able to leave behind his past as the Arrow, and, if so, what becomes of the team he has worked so hard to assemble? Will Diggle, Thea, and Laurel be left to continue Oliver's crusade without him? And with Malcolm Merlyn having ascended to the top of the League of Assassins as the new Ra's al Ghul, is anyone really safe? While we wait for more details on this upcoming season, check out the first look at Lady Cop below.